NAIROBI, Kenya, October 6, 2014 (ENS) – Wario Galelo, 64, raises livestock downstream from the site of a hydroelectric dam which the Kenyan government plans to construct on the Ewaso Ngiro river in the north of the country. Like many other local residents, he is furious about the dam, which will be located in Oldonyiro in Isiolo County and cost around ten billion Kenyan shillings (US$125 million). Although the hydroelectric scheme will provide water and power to residents of a new city planned in Isiolo County, pastoralist communities in the area worry it will jeopardize their already precarious livelihoods by disrupting water flows on the river. 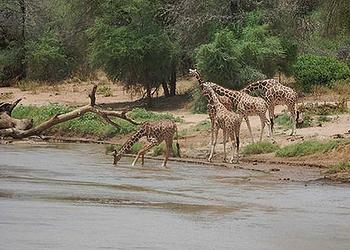 The Ewaso Ngiro river is a lifeline for the more than three million people who keep livestock along its banks. People in Isiolo and in the neighboring Samburu and Laikipia counties have already seen the river’s level drop because of drought and major irrigation projects. The waters are also polluted by industrial waste dumped upstream. Wario says he lost more than 400 goats and nearly 100 cows and camels to drought last year, and fears that the dam would threaten his remaining stock of just 30 goats and one cow. He says he will would “fight to the end” to oppose construction of the dam. In its feasibility study for the project, published in November 2013, the National Water Conservation and Pipeline Corporation (NWCPC), a State Corporation, said the dam would channel water to about 90,000 people by 2016. A further 180,000 people would benefit directly from the dam by 2036, and even more would be able to access water pumped from the river. The whole project falls under Kenya’s Vision 2030 development framework. 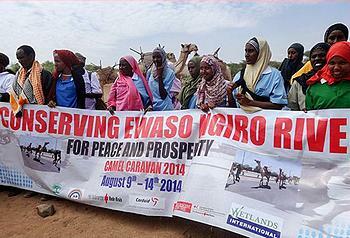 Livestock-herders say broader public consultation needs to take place. Jothan Dida, a pastoralist from Isiolo, said that the government must clarify how people would access water from the dam while still benefiting from pastures and fishing along the river. “We can agree and allow the project to continue if the proponents of this project engage our communities more and tell us plainly the practical steps and measures they have in place on how we would get water and other resources from the dam, and what long-term plans they have to mitigate its effects,” Jothan Dida said. Living downstream from the proposed dam site, like most pastoralists in the area, Jothan Dida had 500 goats before prolonged drought set in. He now has just 150 goats, and all the cattle he owned are now dead. Persistent droughts, punctuated by flash flooding, often force pastoralist herders to move south towards the upper reaches of the Ewaso Ngiro in search of water and grassland. NWCPC did not respond to questions about the nature of its public consultations, pointing instead to the feasibility study, which states that it has already engaged the public through direct interviews, questionnaires and meetings. The document says local politicians, district officers and area chiefs were also consulted. 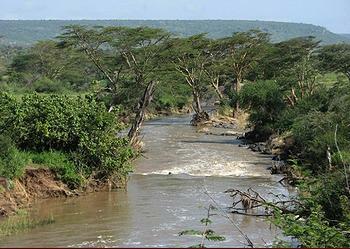 Joseph Lejeson, a program officer at Indigenous Movement for Peace Advancement and Conflict, an advocacy group, said that the dam would disrupt the lives of traditional herding communities who depend on the river – the Samburu, Rendille, Borana, Turkana and Maasai. “When the dam is finally constructed and water flow is [diverted], the downstream pastoralists will be forced to move upstream with their livestock in search of water and pasture near Oldonyiro dam, and obviously there would be a fight over these resources,” Lejeson said. Mohammed Dida, who works for Cordaid’s disaster risk reduction program in Isiolo, predicts that water shortages caused by damming up the river will lead to inter-communal strife. On August 21, four herders were killed on the border between Isiolo and Samburu counties in what the government said was a conflict over pasture land and water. Experts like Mohammed Dida say the water flow from the dam must be properly regulated in order to ensure a steady supply for people living downstream of it. The dam scheme exemplifies the kind of big infrastructure project that requires a sensitive approach so as to ensure that local communities feel they are being listened to rather than ignored. Caleb Wanga, who works for the Usalama Reforms Forum, an organization advocating for security sector improvements, urged the government to think about groups that stand to lose from this kind of project. The pastoralists are increasingly finding that the open lands their animals once ranged over are being transformed into intensively irrigated farms. Sirak Temesgen, a delegate for disaster risk reduction at the Netherlands branch of the Red Cross, said communities along the Ewaso Ngiro river basin are already struggling to adapt to these changes, brought on by outside investment. The government has made some effort to address land use problems through the Water Resources Users Association (WRUA), which brings together some of the communities on the Ewaso Ngiro river. The Water Resources Users Association oversees natural resource governance at local level. Its critics, however, say it has yet to bring about real improvements. “There is an urgent need to build [WRUA’s] capacity to deliver appropriate services,” Temesgen said, adding that pastoralist communities needed to be better informed about current legislation on water and land management.